Typically, sanitary sewer systems transport household, commercial and industrial wastewater to a sewage treatment plant for treatment, while storm sewers transport rainwater and melted snow where it is discharged into a waterway. In most areas, these two types of systems function separately from each other, but in 21 older New Jersey communities, as well as several hundred communities across the nation, the sanitary and storm sewers are combined. Combined sewer systems are shared underground piping networks that direct both sewage and stormwater to a central treatment system before being discharged into a waterway. During heavy rainfall or significant snowmelt, the systems overflow, causing discharges of mixed sewage and stormwater to the waterway. Combined sewer systems are remnants of the country’s early infrastructure and are located in older urban areas. In combined sewer areas, all wastewater flows during dry weather are conveyed to a sewage treatment plant where it receives appropriate treatment before it is discharged to the waterway. However, when it rains or there is snowmelt in combined sewer areas, the additional high volume of rain water or melted snow can overwhelm the capacity of the pipes in the combined sewer system or sewage treatment plant. Combined Sewer Overflows (CSOs) provide a hydraulic release for these combined sewer systems when they are over capacity. Without CSOs this mix of sewage and stormwater could back up into homes, businesses, and other public places. Combined sewer systems were designed to overflow during these periods and discharge excess wastewater directly from the combined sewer systems, through a CSO to nearby streams or rivers, instead of being transported to the sewage treatment plant. The result is an overflow of untreated combined sewage and stormwater. These discharges often contain high levels of total suspended solids, pathogens, nutrients, oxygen-demanding organic compounds, oil, grease, and other pollutants that impair water quality and the recreational use and enjoyment of urban waterways. How are Combined Sewer Overflows controlled? CSOs can be reduced or eliminated through gray and green infrastructure practices. Gray infrastructure refers to traditional practices for stormwater and wastewater management, such as cleaning or replacing pipes, sewer separation, expansion of the sewage treatment plant, or treating the wastewater at the outfall. Another gray infrastructure solution is the installation of netting or bar screens, also known as solids and floatables control at the outfall. This prevents solids that are greater from one half inch from entering the waterway. Traditional, or gray infrastructure, generally focuses on collecting rainwater and conveying it to the treatment plant for treatment before it is discharged into a waterway. Green infrastructure, on the other hand, mimics natural processes utilizing soils and vegetation to manage rainwater where it falls. Green infrastructure refers to methods of stormwater management that reduce stormwater volume, flow, or changes the characteristics of the flow into combined, sanitary, storm sewers, or surface waters. Green infrastructure allows the stormwater to infiltrate the ground, to be uptaken by vegetation, filtered by soils, or to be stored for reuse. Green infrastructure practices include, but are not limited to, pervious paving, bioretention basins, vegetated swales, and cisterns. The use of green infrastructure encourages the idea that stormwater is a resource that can be reused. 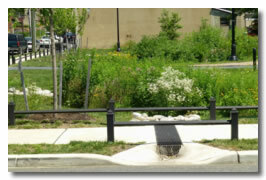 Green infrastructure solutions reduce the amount of stormwater entering the combined sewer system. Green infrastructure strategies reduce runoff volume by allowing rainfall to infiltrate into the soil where it can be used by plants or where it can recharge aquifers and stream baseflow. Another way to reduce volume is to capture the rainfall in man-made structures like rain barrels or cisterns where it is stored until it can be reused; however, the use of this stored water is limited to non-potable uses, such as irrigation. For more information on green infrastructure, visit the Department’s green infrastructure website. Where are Combined Sewer Overflow outfalls in NJ? The below interactive map provides the location of, and information on, the 212 Combined Sewer Overflow outfalls in New Jersey. These outfalls are located in a total of 21 municipalities. Click here to view the below map in a separate webpage. When did the Department start regulating CSO discharges? In 1994 the US Environmental Protection Agency established the National CSO Policy to bring all wet weather CSO discharge points into full compliance with the technology-based and water quality-based requirements of the Clean Water Act. The National CSO Control Policy requires permittees to implement the Nine Minimum Controls, and to develop and implement a Long Term Control Plan. The National CSO Policy promotes a phased approach to the control of CSOs through a series of permits that include progressively more stringent requirements. The Department issued the first Master General Permit (MGP) on January 27, 1995 which became effective on March 1, 1995. Under the 1995 MGP, permittees which own and/or operated any portion of a combined sewer system were required to develop and implement technology-based control measures including the Nine Minimum Controls. Additionally, the permittees were required to initiate the first element of the Long Term Control Plan, by requiring the development of Combined Sewer System Characterization Studies to demonstrate the relationship between rainfall, runoff and sewer system responses. In 2004, the Department revoked and reissued the MGP. Under the 2004 MGP, existing requirements remained in place and the Department added several new provisions to require permittees to address four additional elements of the CSO Long Term Control Plan. The permit required permittees to develop, with Department oversight, a Public Participation Plan, evaluate a specific set of alternatives, develop appropriate cost and performance curves, and maximize conveyance for treatment at the existing treatment plant for wet weather flows. Permittees with CSO outfalls were required to develop and evaluate a variety of disinfection control alternatives. In 2015, the Department issued Individual CSO permits which build upon the previous permit requirements. Permittees should consider what work has already been performed and how past achievements may be incorporated into new efforts to satisfy the new individual CSO permits. The individual permits address site specific conditions and promote coordination of a Long Term Control Plan among all permittees within hydraulically connected sewer systems. Since the issuance of the first NJPDES permits to regulate CSOs, the total number of CSO outfalls in New Jersey has been reduced from 281 to 213; a reduction of more than 20%. Additionally, solids and floatables controls have been installed at nearly every CSO outfall to prevent solids that are greater than one half inch from entering the waterway.